If you thought that HTC has been kicked to the curb after its Pixel-making team of engineers got snatched by Google, the freshly unveiled U12+ flagship will quickly change your opinion. Despite the brain drain, the company really delivered a modern flagship that is up with the best, even though, or perhaps precisely because, it said that it will scale back on its overall 2018 portofolio for obvious reasons. So, without further ado, what's the takeaway from the new HTC U12+ announcement? Well, that it is an heir to the U11+, for starters, not the U11, and we'll take it from there. Thankfully, HTC resisted the urge to splash a notch across the top bezel, yet still managed to make a narrower 6-incher than, say, the OnePlus 6. With that out of the way, the U12+ is still a rather tall phone, with thicker and heavier than the average for the category body. Before its announcement, the U12 got listed on Verizon's Open Development website as having "frameless" design, indicating thinner bezels all around, and it delivers, especially when it comes to the all-important side framing that impacts heavily one-handed navigation. This is aided further by the round fingerprint scanner placed on the back, and the dual rear camera is ergonomically placed in the middle of the rear, instead of thrown into a corner where it might be inadvertently covered with your finger while holding the phone sideways to take pictures. HTC calls the new mirror glass coating of the U12+ with the term Liquid Surface, and it is seemingly a variation of what Huawei did to the P20 series in terms of "color-shifting hues" when looked on at various angles. There is a Translucent Blue version that showcases the phone's internals (yep, Jerry Rig Everything style, but straight out of the factory), and a stylish Ceramic Black, as well as a flashy Flame Red model. HTC's newest phone sports IP68 water-resistance certification, too, so expect pricey repairs with all that glass and adhesive, like on most current flagships. Being able to wrap your palm around the U12+ easily has been the goal of HTC, it seems, as it is introducing Edge Sense 2 with the phone. The technology again offers pressure-sensitive sides, so you can do plenty with just squeezing the handset with variable force. To that, HTC now adds double-tapping, as well as simply holding. Edge Sense 2 can tell which hand you are grabbing the phone with, and adjusts accordingly. You can double-tap instead of stretching to use the virtual back key, for instance, and we can't praise HTC far enough for those navigation gesture decisions on what is becoming an annoying trend of huge 6-inchers that put our thumb-stretching skills to the limit. Alternatively, just holding the phone will lock its rotation and prevent the screen from dimming, so you won't have those inadvertent screen flips or light out when you are lying in the bed, for example. HTC says you can map and adjust each and every interaction with the phone with the three pillars of Edge Sense 2 - squeezing, tapping and holding - and those will work with most apps in the Google Play store as well, not only in the stock applications, sweet! All rumors for a 6" QHD panel with the now de facto standard 18:9 aspect ratio, turned out to be true. Getting to the bottom of it is not something that required much guessing, as, again Verizon, confirmed that it will be a Super LCD 6-gen display with 1440x2880 resolution. We are getting a bit tired of those 6-inchers, frankly. Even though they are usually narrower now, than when phones had 16:9 displays, they still result in large handsets, no matter how much bezel you trim. Still, HTC was smart to provide gesture navigation that doesn't require finger yoga, so we'll let this one slide. The screen goes way beyond the standard color gamut, and can support "wide-color" DCI-P3 images, and HDR10 video playback as their creators intended, like most major flagships these days. The first leak about the U12, way back in March, actually tipped the chipset it will be coming with, as it was showcased as being capable of delivering download speeds of 809.58 Mbps - pretty close to the 1.2 Gbps that Qualcomm's X20 LTE modem in the Snapdragon 845 processor is capable of. Granted, Samsung had short exclusivity on the 845 for the Galaxy S9, but now it's fair game, as both the LG G7 and Xiaomi Mi Mix 2s, as well as the OnePlus 6 are equipped with one. A 6GB RAM/64GB storage is the basic memory combination for the U12+, while a version with 128GB will go for fifty bucks more. 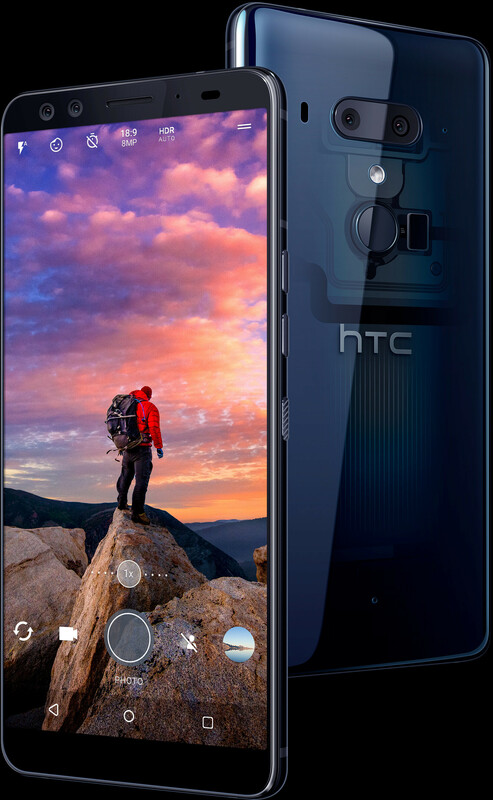 HTC enters the modern multi-lens game for its flagships for the first time since the days of the M8, and does it with a bang, introducing dual front and rear cameras. The U12+ sports a 12MP, optically-stabilized main camera, with large 1.4 micron pixels, aided by a 16MP telephoto lens that does 2x magnification. At the front, there are two 8MP selfie cameras for better portrait shots, and better face recognition (yep, face unlock is all the trend now), but also with wide angle lens, screen flash, AR stickers (again), and HDR Boost, so expect some mighty pretty selfies. The main camera records HDR10 video, and has ultrafast whole-sensor phase detection autofocus, aided by laser autofocus. The kit is able to do 4K video at 60fps, as well as 1080p slow-mo at 240fps, too. Given the excellent results that the U11 produces with a single camera, we'd bet that HTC will nail it again with photo and video quality out of the U12+. For what it's worth, the HTC U12+ now has the highest DxO Mark score for a dual camera phone, so HTC must have done something right with those algorithms. Besides upgraded BoomSound stereo speakers, with separate tweeter and woofer, the U12+ features other audio niceties, like no less than four microphones for noise-cancellation and surround sound recording, scattered strategically around the body of the phone. Those surround mics mean that HTC's Sonic Zoom is here again, allowing you to focus on a particular source of sound or voice in a video, with louder and clearer results than before, while the Audio Boost feature gives extra strength to the "3D audio" recording for some pretty stellar sound to go with your pretty 4K footage. The 3500 mAh battery pack may not sound like much, but HTC's Sense interface was one of the first to manage background processes well, before even Google incorporated it in system-level Android, and the company's phones manage to show good battery life for the capacity of the packs inside. In addition, there is a fast charging option present for when you run out of electrons on a busy day. That WQHD display resolution, however, means you will get at least 30% less endurance than a comparable phone with 1080p screen, no matter how frugal the second-gen 10nm process of the Snapdragon 845 is. The graphics subsystem and backlighting just have to maintain more than a million extra pixels in this case, even of you artificially lower the resolution in the settings, so we wouldn't expect two-day battery out of the U12+. Ceramic Black on htc.com and amazon.com. Our bet on $700-$800 price range for the U12's wonders was actually a bit conservative, as HTC is asking $799 for the 64GB version, and $849 for the 128-gigger, but in this day and age, such tags can't surprise anybody. They are indeed a bit higher than the direct competition of the Galaxy S9 or LG G7, and yet HTC offers a tad more - more cameras, more sound, interactive sides, and that sweet Translucent Blue version that shows off the phone's offal. Any takers? Scale 40 to 12... Or 12 from other to 40 It will look better than apple or samsung. I'll pick one up in a few months at half the price. Excellent phone HTC! Respect to them for sticking with their guns and not blindly copying apple. This is coming from an iphone X user. Because apple made the notch to put all the sensors+face id system up there. If they went with a notch they'd have had to have a huge one like the iPhone X because of dual cameras and size of the speaker. And that would be copying. I find the iPhone X notch to be pointless. There's so little space either side for it to be of any real use. A couple of icons and the time is all you can fit. Most other notches are fine because you can fit a lot of info up in the vacant space. Apple's concern was most likely that if they didn't go for a notch then it would look odd with a top bezel and no bottom bezel, therefore what do you do? Add a bottom bezel for symmetry? Sure, but then you've basically made a Samsung clone. If it only had a jack + FM radio..
"Liquid Surface, and it is seemingly a variation of what Huawei did to the P20 series in terms of "color-shifting hues" when looked on at various angles" Nice joke. HTC first implemented the feature with the U11. Don't associate HTC with those copycats.